Metrics Dashboard is another feature which is given by Test Link. As name suggest it is all about Dashboard. We are going to learn about reviewing dash board in Test Link. Dashboard will provide you information about selected test project. You will be able to see all the test case execution detail here. Only Active Test case is displayed on this screen. If Project is inactive then metrics dashboard is not working for that test project. Project must be active so active part will be displayed on screen. As project release will arrive, a tester will run the test cases and accordingly all detail will be generated and displayed on dashboard. All information will be displayed in percentage. How many test cases are executed? How many test cases are remaining? How many test cases are failed? How many test cases are blocked? How many test cases are passed successfully? How many test cases are not run? This all information is displayed on Dashboard. Date is also mentioned on screen. When you create dashboard it will be displayed in bottom of the screen so you can verify whole information date wise. Overall progress of a test plan will be displayed on screen. It is a quick look of test project progress. Whole result of execution test cases will be displayed here with proper percentage. Test link is providing us this functionality for verifying test project growth. Test manager can review running test project from this dashboard information. Dashboard is not for client. We cannot send project progress as dashboard screen. For that we can create project reports which we will learn in next article. You can select different option from Dashboard filed. As per the project progress it will display you the information in group you need to expand it. Next option is as per your selected ‘column it will display you information. You will see it in given image. Now next option is ‘Refresh’ and ‘Reset the filters’. This all option is given for a test project which is maintained by test link for very long period. Now we will do the steps for generating metrics dashboard for a test project. As we have idea, we need to login with Test link. Then Select a test project for which you need to generate dashboard. 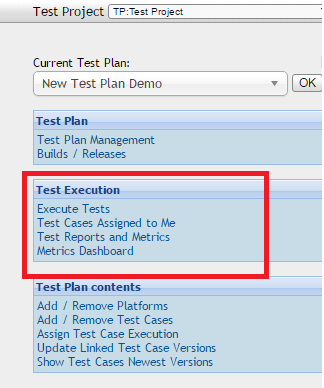 Now you will navigate on home page from where you need to select ‘Metrics Dashboard’ from Test Execution tab. Refer above image; here you need to select ‘Metrics Dashboard’. As we will click on it you will navigate to another page. This is the main image which describes Metrics Dashboard. As you can see here a test project is already selected. The next information is displayed about Test cases Status. All information is displayed with percentage. ‘Not Run’ test cases , ‘Passed’ Test cases , ‘Failed’ Test cases , ‘Blocked’ Test cases , These all status of test cases and it will be displayed as per image. Moving forward, we can see overall project progress. This will display active test cases , Not run, Passed, Failed and block test case status in percentage and then in last Test link will display Total Progress in percentage. You can verify it in image. As we have discussed if test project is maintained for long then it will have group for Extend, it will have more column to display proper data, Refresh Button and Set Filter option. Afterwards you can see Date and time in Dashboard. In image it is displayed. Dashboard is very good option for verify Day to Day progress. This is all about Metrics Dashboard in Test link.